Kansas City’s mayoral candidates went eastward Saturday, and not all received a warm reception. In fact, two of the candidates, Mayor Mark Funkhouser and Councilwoman Deb Hermann, got a downright chilly response. The forum drew a crowd of about 100 people at the Bruce R. Watkins Cultural Center on Blue Parkway. The candidates on hand, besides Funkhouser and Hermann, were Mike Burke, Jim Rowland, Sly James and Charles B. Wheeler. Henry Klein was absent. Under the rules of the forum, sponsored by The Call newspaper, people in the audience had a chance to question the candidates directly. When that part of the program arrived, about 10 people quickly lined up behind the microphone. His explanation drew no applause or expressions of approval from the audience. Like Funkhouser, Hermann got very little, if any, positive response from the audience throughout the event. Another candidate who got roughed up a bit was Rowland, who has secured the endorsement of Freedom Inc., the city’s major black political organization. After Rowland bragged that $180 million of the $700 million Sports Complex improvement project had gone to women- and minority-owned businesses, Eric Wesson, an event moderator who is news editor of The Call, challenged him, saying he didn’t think the minority role was as significant as Rowland depicted it. 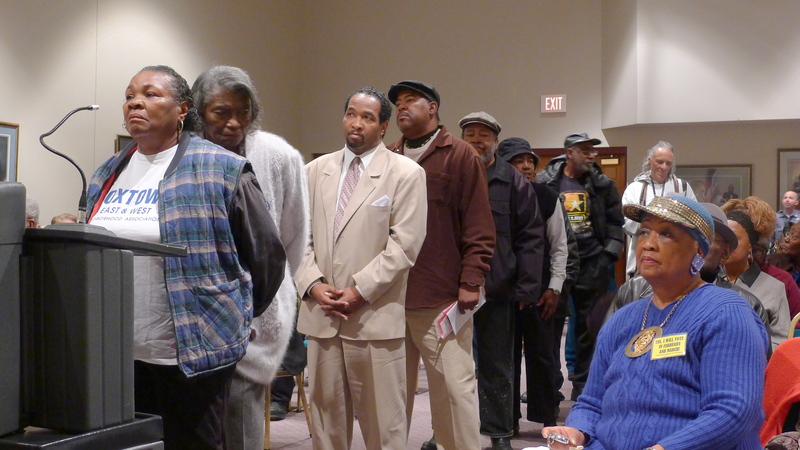 The audience’s lack of embrace for Funkhouser, Burke, Rowland and Hermann could indicate that each will have a problem getting a significant number of votes from black residents. Funkhouser has never been popular with black voters; Burke and Hermann hail from the Northland; and Rowland lives in the 4th District, in western Kansas City. The only candidate who received anything close to a warm reception at the forum was Sly James, who is the only black mayoral candidate. He drew applause a few times, including once when he countered a moderator’s assertion that the City Council had no direct role in the quality of education in the Kansas City School District. Nevertheless, James, a lawyer, has his work cut out for him on the East Side, partly because he doesn’t live there and partly because he didn’t get Freedom’s endorsement. Also, this is his first run for public office, while all of the other candidates have run for or held public office before. It appears at this point that the vote in the black wards could be very dispersed in the Feb. 22 primary. That would hurt Rowland and help Hermann, whose popularity in the Northland might give her the single largest voting block. Burke expects to do well in all parts of the city, but he has no single area that he can count on for great numbers of votes. Klein and Wheeler are out of it. No chance. Funkhouser is fading fast, as the other candidates have started to use him for the punching bag that he is. James sounds good but has no record to back up his words. Rowland comes off as knowledgeable but antiseptic, seldom connecting with his audience. That leaves the two Northlanders — Hermann and Burke — as the favorites, at least in my book. Hermann comes across as genuine, unpretentious and level-headed. Burke, although hardly charismatic, is as solid as a rock and has built up a trove of goodwill citywide, partly through his service on just about every economic-development agency that operates in the city. They are the best candidates, and, for the future of Kansas City, let’s hope they are the top two finishers on Feb. 22. 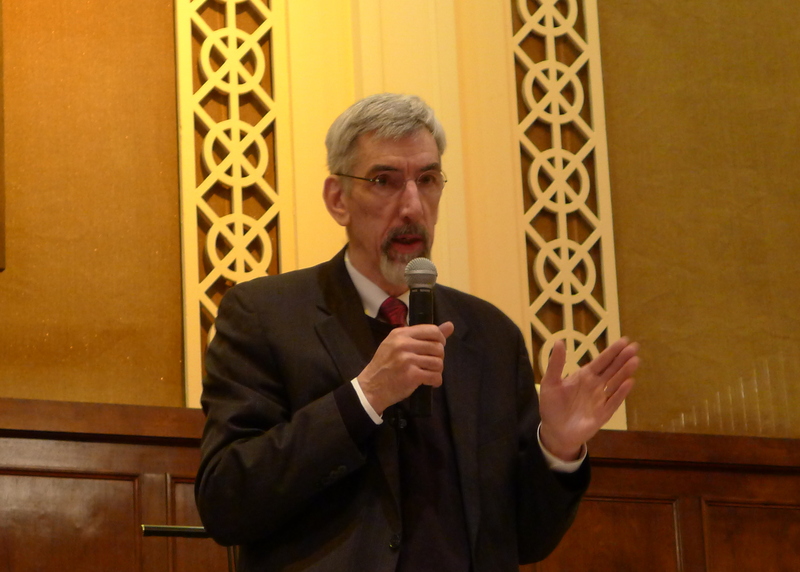 Given the legal developments of the last week or so, that would be a suitable refrain for Mayor Mark Funkhouser and other City Council members, including mayoral candidate Deb Hermann. Join me, then, in taking a closer look at that story and two others — one a local story that became national and one out of Chicago. :: The tidal wave of money going out of City Hall because of legal setbacks. Translation: Bad news for incumbents. The front page of today’s Kansas City Star — the lead story, in fact — tells most of the ugly story. In the last four days, courts have awarded more than $5 million to two former employees who were wrongfully terminated and to a judicial candidate who was on a panel that the City Council improperly rejected in 2006. On Thursday, a Jackson County Circuit Court jury awarded more than $2.6 million to two former budget analysts — 63-year-old Jordan Griffin and 54-year-old Colleen Low — who claimed the city discriminated against them when it laid them off in 2009. Part of the problem for the city was that Griffin and Low were laid off by now-acting City Manager Troy Schulte after Schulte told them they wouldn’t be laid off. City Hall reporter Lynn Horsley wrote in her story that the Supreme Court ruling “sent shock waves through City Hall,” partly because employees worried that the ruling might adversely affect their wages. I mentioned that Horsley’s report told most of the story. For some reason — perhaps because she’s not the sort to pile on — she omitted the City Council’s approval last week of a $125,000 settlement with a former aide to Mayor Mark Funkhouser. Funkhouser fired the aide, Shawn Pierce, because Pierce sided with another mayoral employee, Ruth Bates, who also sued the city successfully. The city had to shell out $550,000 to Bates, a black woman who alleged she was harassed and discriminated against by Funkhouser’s wife, Gloria Squitiro. That’s $675,000 in city funds paid out because of Gloria’s totally unprofessional bearing. How will all this play out in the current city elections? Hard to say, but today’s big, front-page headline certainly has to be more than a pinprick for incumbent council members seeking re-election. Two of seven candidates in the mayor’s race are incumbents — Funkhouser, who was elected in 2007 — before the Howard matter came up — and Hermann, who is completing her second term on the council. In fairness to Hermann, she voted against the motion to reject the Howard panel. Her hands are clean on that matter, but the problem is that, to some degree, she’ll be seen by some city residents as having been painted with the same broad brush. On balance, this is probably another major setback for Funkhouser, a medium to mild setback for Hermann and a bonus for the other three top mayoral candidates — Mike Burke, Jim Rowland and Sly James. :: The uplifting story of Gil Meche. He made the front page of Thursday’s The New York Times. NYT writer Tyler Kepner brought to the attention of readers nationwide the remarkable story of Meche, who decided to retire because of a lingering shoulder injury rather than hang on and collect $12 million for the last season of his contract. Inspiring, isn’t it? Someone who values self-respect over cash? It’s a great lesson for young people. On a personal note, when Meche made his last start last season (I don’t remember what month it was), I stood up in the stands and booed loudly at one point, as he got shelled by opposing batters. What I didn’t realize was that Meche was pitching in pain; he couldn’t perform up to his capabilities. I apologize, Gil. :: Unflappable Rahm Emanuel: The force that will not be denied. At the end of a topsy-turvy week, the former chief of staff to President Barack Obama is securely on the ballot in the Chicago mayor’s race. Candidates for mayor are required to have resided in Chicago for at least a year before Election Day. Emanuel left the White House last fall, but Emanuel argued that he was still a Chicago resident because he owned a house, paid taxes and voted there. On Monday, the Illinois Appellate Court ruled that Emanuel did not qualify, saying he had to physically live in the city. On Thursday, the state Supreme Court overturned that ruling, putting Emanuel back on the ballot once and for all. What was perhaps most amazing about this story was how Emanuel appeared to maintain total equanimity during the turbulent days. I guess that after the pressure cooker of the White House, a little dust-up with the top Illinois courts is not something that will not easily rattle a guy. 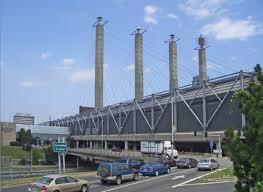 Should KC throw in the towel in its longstanding attempt to be a major convention city? The Funk: YES! The issues of conventions (can Kansas City be competitive?) and development (where’s it gone?) took center stage tonight at a mayoral forum sponsored by the American Institute of Architects of Kansas City. More than 100 people attended the forum at the AIA’s comfortable, cutting-edge space at 1801 McGee. Those in attendance sat in black, hard-back chairs under a wide, red, runway-type ceiling. 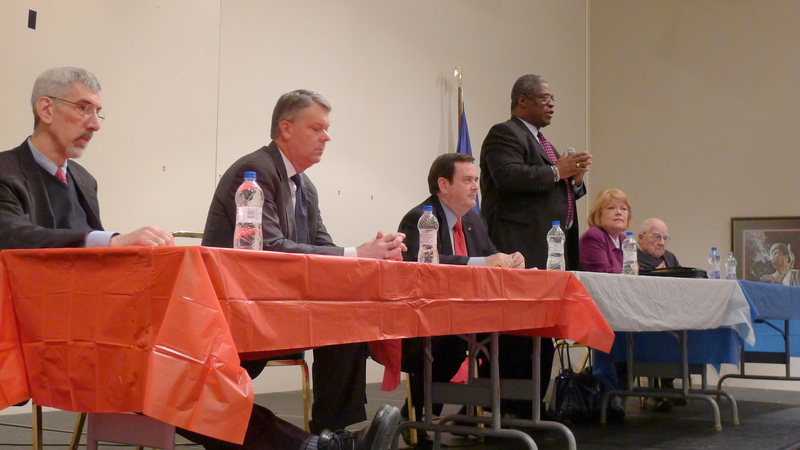 The five mayoral candidates who participated sat at a table in the front of the room, against a red wall that presents as a vertical extension of the ceiling. The candidates took turns answering questions put to them by Kevin Collison, The Star’s development writer. Participating candidates were Jim Rowland, Henry Klein, Sly James, Mayor Mark Funkhouser and Mike Burke. An AIA official said Deb Hermann had informed the group that she would arrive late, but she failed to show. Later, she said she had attended a long-scheduled campaign event at a home in the Brookside area. “You can’t just hit everything,” Hermann said, referring to the many mayoral events. 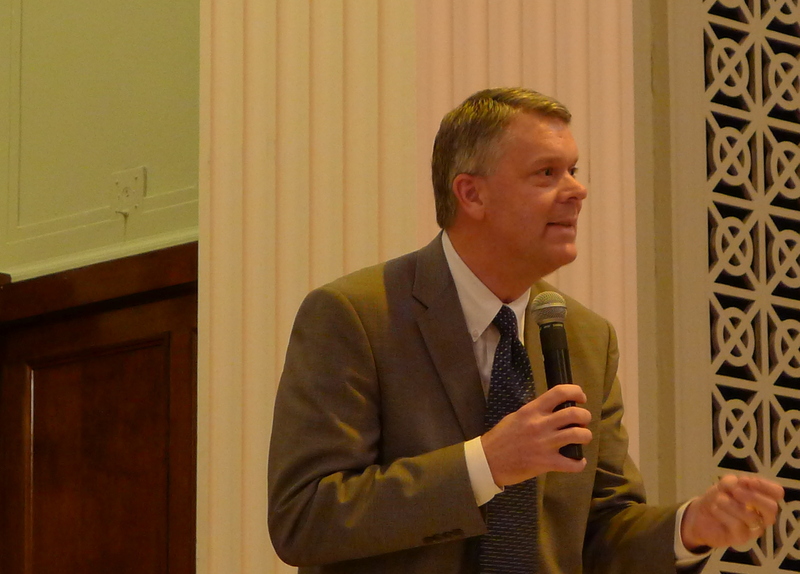 The seventh mayoral candidate, Charles B. Wheeler, said later when reached at home that he didn’t know about the forum. The AIA official said she had either e-mailed or called the Wheeler campaign but had not heard back. 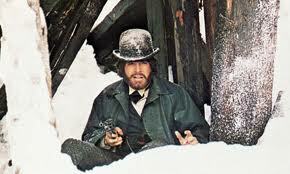 “That’s possible,” Wheeler said, adding that he was enjoying a Laurel and Hardy movie on TV. Wheeler and Hermann missed a good show. The discussion was energetic, for the most part, and sometimes intense. In surveys and elsewhere, he said, few city residents cite a convention hotel as a high priority. 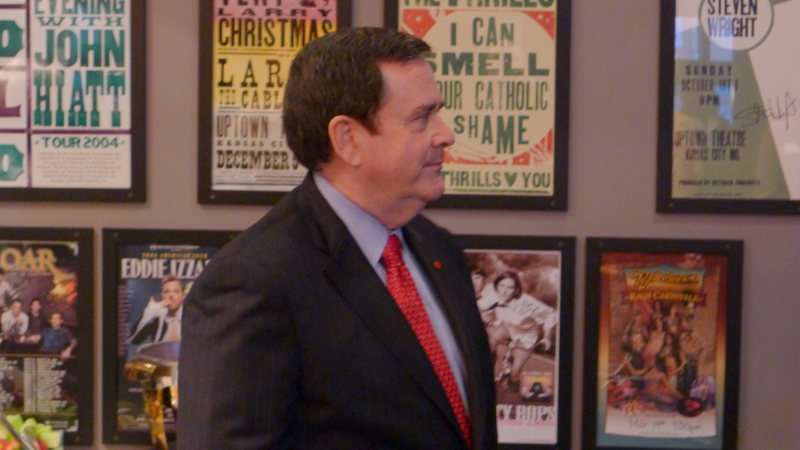 Sitting to Funkhouser’s left and answering after Funkhouser, Burke, a former Convention & Visitors Bureau board member, took a sharply contrasting position. Convention business is critical to the city, he said, and the need for a downtown convention hotel is great. Klein said he was “very skeptical” about the feasibility of a convention hotel and pointed to the bankruptcy of a downtown hotel in St. Louis (apparently a Sheraton property that failed last September) as good reason to be skeptical. Rowland urged patience, saying “a process is in place” that probably would determine whether the city should provide significant financial incentives and backing for such a project. He was referring to a steering committee that has been studying the issue and could make a recommendation to the City Council as soon as March. Starting off, Burke handed out a grade of “D,” citing the “collapse” of the Plaza’s West Edge project and the loss of the Wizards soccer team (going to KCK) as evidence of significant slippage. He offered optimism, however, saying “we’re coming out of this recession” and that the city needs to take advantage of the improved situation. Like Burke, James issued a grade of “D,” and Klein, while he took his full quotient of time, didn’t give a specific grade. He said, among other things, that incentives the city handed out in earlier years (presumably for projects like the Power & Light District) might have created the illusion that things were significantly better back then. The evening had its funny moments. At one point, for example, Rowland found himself agreeing with Funkhouser on an issue, after having agreed with him on another issue minutes earlier. The last question of the evening — from an audience member named Tiffany Miller — made all of the candidates, except Burke, squirm. As a prelude to her question, which had to do with a HUD home-repair program, Miller said she had e-mailed her question to each of the candidates, using e-mail addresses on their web sites. Burke was the only candidate to respond, she said. The candidates — except Burke, who was smiling contentedly — scrambled to come up with reasons why they had either missed the e-mail or failed to respond. Funkhouser covered himself by saying he had spoken with Miller about the issue in the past. James said Miller’s e-mail was in a queue of 200 or 300 messages that he hadn’t read yet. Then came Rowland with a real head-scratcher. “I haven’t been home or slept the last 48 hours,” he said. That was greeted with tittering from the audience. Minutes later, after the forum had ended, I asked Miller what she thought about Rowland’s explanation. “Yeah, my dog ate it,” she said. The mayoral field: Which candidates will establish themselves as pack leaders? Over the next few weeks, the campaign for mayor will get increasingly interesting, and probably more pointed. With the holidays in the rear view mirror and baseball season a long way off, the mayor’s race is about the only excitement on the immediate horizon. By default, if nothing else, people will begin taking a closer look at the seven candidates heading toward the Feb. 22 primary, when the field will be whittled to two. Several mayoral forums are scheduled to be held this week. All are open to the public. — 8:30 a.m. to noon Tuesday, Kansas City Regional Transit Alliance, City Stage Theatre, Union Station. Each candidate will have 30 minutes to answer questions on mass transit. — 6 to 7:30 p.m. Tuesday, American Institute of Architects, Kansas City Chapter, 1801 McGee, Suite 100. — 11 a.m. to 12:30 p.m. Saturday, The Call, Bruce R. Watkins Cultural Heritage Center, 3700 Blue Parkway. ** Jim Rowland. 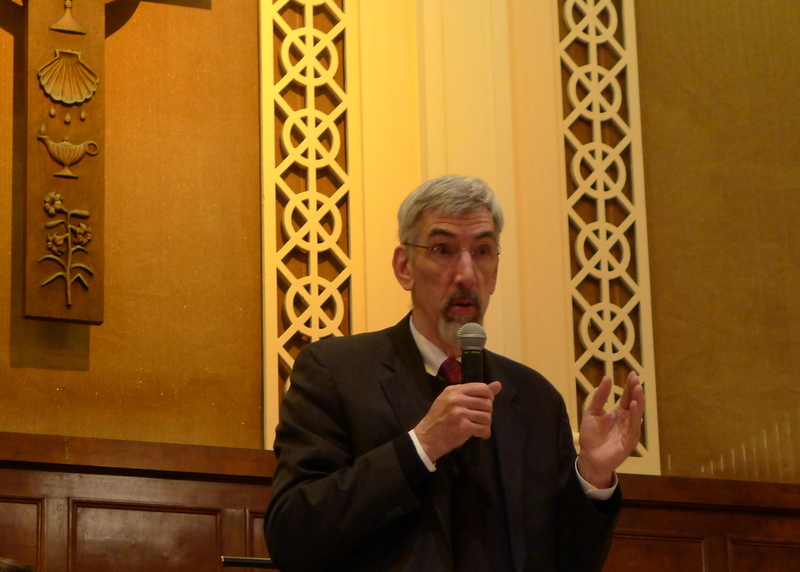 The “corridor kid” made good points at the Central Presbyterian Church forum last week when he reminded the audience what a jerk Mayor Mark Funkhouser has been. He’s the first mayor in at least 40 years to banish a council member (Jan Marcason of the Fourth District) from all standing committees. But Rowland has a couple of major problems: Beady eyes and a sour personality. ** Mike Burke. Has the deepest, broadest background in civic matters and projects confidence. Needs to sharpen his message, however, and tell people clearly why he is the best candidate and paint a sharper picture of where he would lead the city. (He also needs to drop his “perfect storm” explanation for why things have gone so badly at City Hall the last four years. It wasn’t the jet stream that wreaked havoc at City Hall; it was the mayor and his spouse.) Burke hurt himself by initially refusing to publicly talk about the Port Authority scandal, citing attorney-client relationship. (He was general counsel at the time.) Documents unearthed by The Star, however, show that after learning about the $9.7-million contract between the company developing the Richards-Gebaur site and a company owned by another Port Authority attorney, Burke wrote a scolding letter to the attorney, William Session. :: Deb Hermann. Straight shooter. Easy to talk to. Has guts. (Stood up to Local 42’s demand that the city include the former MAST employees in the city pension system at an estimated cost of $30 million.) Her kindly grandma appearance and non-threatening manner stand as appealing contrasts to Funkhouser’s bashing, avenging ways. Leadership is a question, though. She’s led the Finance and Audit Committee, but is that enough? :: Henry Klein and Sly James. Well-meaning and well-spoken individuals who add a lot to the discussion. However…these and similar pretenders from past elections (Stan Glazer, Gomer Moody, etc.) who wake up one day and think, “Hey, I could be mayor,” need to go back to investing, the law, show business, liquor sales and whatever else it is they do and stay there. The last 40 years of Kansas City history shows that you can’t get elected mayor unless you’ve held another major elective office (Charles B. Wheeler); served on the council (Richard Berkley, Emanuel Cleaver and Kay Barnes); or been hand-picked by The Star’s Yael Abouhalkah. Suggestion: If you really want on the ballot, Charlie, hire Clay Chastain to get your signatures. He needs something constructive to do to take his mind off himself. Ordinance No. 110056 popped up at the last minute Thursday, too late, as the clerk said, to be included in the printed docket. It didn’t involve a lot of money, relatively speaking — $125,000 — and it generated virtually no discussion. But it sure packed a political wallop. Yes, it did. It could hardly have come at a worse time for Mayor Mark Funkhouser, who has spent the last year or so trying to put “the Gloria thing” behind him. The Gloria thing, of course, was the long-running flap over wife Gloria Squitiro’s presence at City Hall, when she worked there as a full-time volunteer in his office. Worked, as in scorched the walls of the old Art Deco building with a blowtorch and breathed fire down the throats of many regular, salary-earning employees. You’ll recall that Squitiro refused to leave City Hall and that her husband — uh, the mayor — didn’t have the good sense, or maybe the courage, to tell her to do so. The council had to pass an ordinance, later thrown out by a judge, forcing her to do so. Of course, it goes a lot deeper than a domineering wife getting her way and a deferring husband nodding to the status quo. The city had to pay out $550,000 to a former mayoral aide, Ruth Bates, who sued Funkhouser, Squitiro and the city for Squitiro’s alleged harassment of her and discrimination against her. The city paid the money after settling with Bates, while Squitiro’s insurance company paid Bates an additional $45,000. Let’s think about that again, as we approach the Feb. 22 primary election, in which Funkhouser is one of seven announced candidates...Five hundred fifty thousand dollars of taxpayer money was lost to the city because of Mrs. Funk’s tart tongue and poor judgment. And she wasn’t even a full-fledged city employee. She was a squatter! That brings us to Thursday and Ordinance No. 110056. Bates’ lawsuit wasn’t the only one filed as a result of the Squitiro rodeo at City Hall. Shawn Pierce, a former aide to Funkhouser, filed a suit last January alleging that Funkhouser fired him because he had sided with Bates in that fracas. There must have been something to Pierce’s claim because last month the city agreed to pay Pierce $125,000. “We have an agreement in principle,” Pierce’s attorney said at the time. On Thursday, it was time for the council to approve the settlement. And who introduced the ordinance? None other than Deb Hermann, a second-term council member who appears, on the basis of endorsements and momentum, to be the leading contender in the Feb. 22 primary. 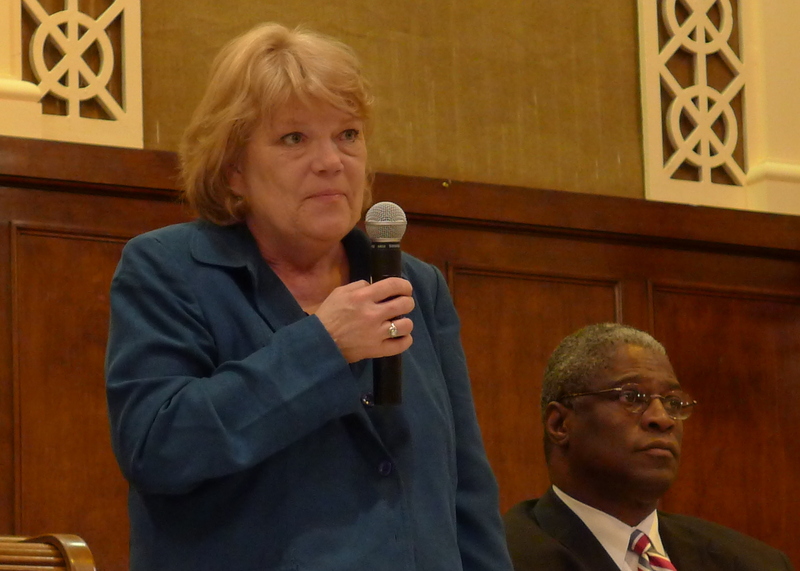 Hermann, chairwoman of the council’s Finance and Audit Committee, was in a difficult position Thursday. I would think that, to some degree, she relished the prospect of sticking it to the mayor at this time, when the public is starting to pay attention to the mayor’s race. On the other hand, Funkhouser, Mrs. Funk and all the bad stew that has been served up at City Hall the past few years have undoubtedly turned some members of the public against the council as a whole. As a result, Hermann — the only current council member running for mayor, besides Funkhouser — could suffer from association. Earlier Thursday, I asked Hermann if she would vote “yes” for the Pierce payout through gritted teeth. “I’m certainly not happy about this, but I would be much less happy if we had to pay more,” she said. And, so, when it came time for a vote on Thursday, there was very little discussion: Just one question, directed to city staff, to confirm that the $125,000 would come specifically from money budgeted for the mayor’s office. After the city attorney confirmed that was the case, the clerk proceeded with a roll-call vote. There were 11 “ayes,” one person absent (Councilman Bill Skaggs) and one abstention — the mayor. Now, let’s do the math. Five hundred fifty thousand plus one hundred twenty-five thousand equals six hundred seventy-five thousand. That’s $675,000 in taxpayer funds that has been paid out as a result of Mrs. Funk’s wonderful foray at City Hall. Think about that when you go to the polls five weeks from Tuesday. Besides picking up some key endorsements in recent days, such as mortgage banker James B. Nutter Sr. and Jackson County Executive Mike Sanders, another reason that Deb Hermann is coming on strong in the mayor’s race, in my opinion, is her creative use of signage. I’m not referring to her yard signs, which are good, but to two mobile signs that are being rolled out for maximum exposure. The billboard-type signs, essentially giant yard signs, cover the sides and backs of two U-Haul-type trucks, one of which has been parked along Southwest Trafficway and the other along Burlington Avenue in North Kansas City. The one on Burlington, just past the the north end of the Heart of America Bridge, has been in a parking lot outside Bridge View Hall. 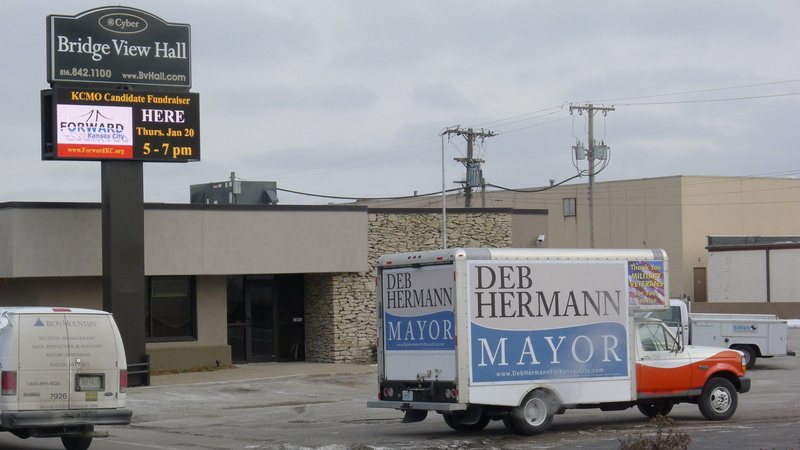 Hermann’s campaign needed approval of the Bridge View Hall owner to park the truck outside his building. The other truck has been parked on 36th Street, just off Southwest Trafficway. I’ve been around politics a long time, but I’ve never seen truck advertising of this quality. I’ve seen a lot of second-rate truck advertising, including the use of homemade signs and irritating bull horns blaring the candidate’s message. But nothing this sophisticated…if you can call truck advertising sophisticated. But Hermann doesn’t take credit for it. She referred me to campaign coordinator Megan Tallman, whose roots are in Westport and who has been involved in many grassroots-type campaigns. 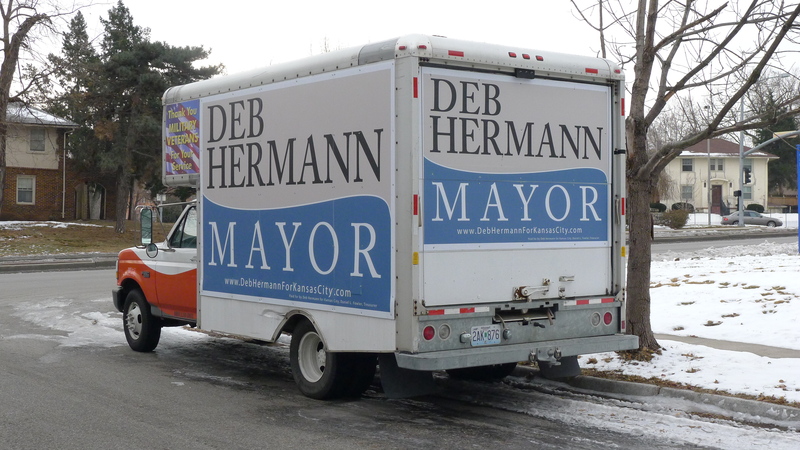 Tallman said she saw similar truck-side advertising used in a Northland campaign last year, and she said she mentioned it at a campaign staff meeting. From there, the idea took off. The person who implemented the plan is a sign-company owner who is a supporter of Hermann. The man ordered the signs and had them affixed to the trucks, which he owns, Tallman said. As a result, it’s not costing the campaign much money. It’s a so-called “in-kind” service, where the sign-company owner donates his cost to the campaign. It would be nearly cost prohibitive, at least in a local campaign, to rent two trucks for a month or more. 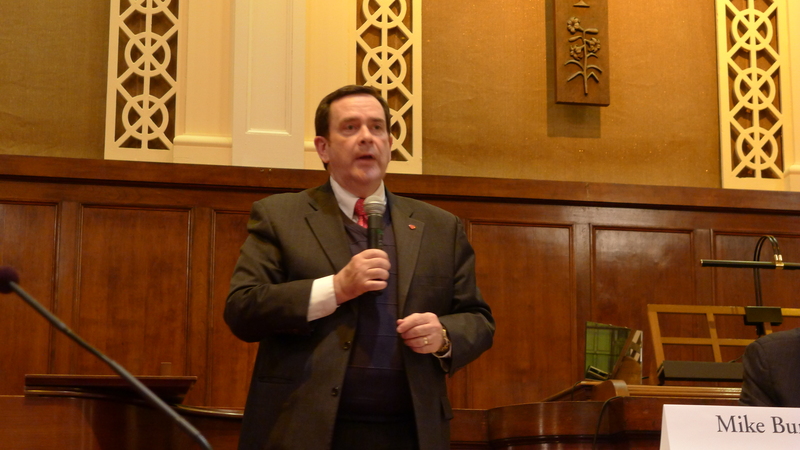 A lot of topics came up for discussion at last night’s mayoral forum at Central Presbyterian Church, 35th and Campbell. Crime, education, the earnings tax, city services, the Plaza, urban blight, subsidized housing. And others. But the undercurrent of the night — the palpable feeling that wove around, under and through all the talk — was the burning desire of the six challengers to see the incumbent, Mayor Mark Funkhouser, turned out of office. I think it’s fair to say that not only do the six challengers — Mike Burke, Deb Hermann, Sly James, Jim Rowland, Henry Klein and Charles B. Wheeler — want Funkhouser out because they want in, but because they think Funkhouser has poisoned the well at City Hall. Not only was that the sense of the challengers; it carried over into at least one prominent audience member, Fourth District Councilwoman Jan Marcason. Marcason sat in the second row of the audience, listening closely, eyes studying the people on the stage. It might seem odd that Marcason, a first-term council member, has become a flash point for the election, but that’s the way it is. Through her dogged battle to boot Funkhouser’s wife, Gloria Squitiro, out of City Hall — where Squitiro was a pesky and unwanted presence in the eyes of many residents and city employees — Marcason has become the face of the oust-Funkhouser movement. For her perceived impertinence, Funkhouser reciprocated by tossing Marcason off the council Finance Committee (where she was vice chairman) and the Transportation and Infrastructure Committee. Burke went first. A former councilman and a former chairman of the city’s Public Improvements Advisory Committee, he talked about the importance of team building — of the implied need for the next group of council members to build a rapport so they could work together effectively. Then it was Funkhouser’s turn. “I’m not sure it’s a lot less civil than it ever has been.” As an example, he recounted an incident when a former councilman came close to physically attacking longtime City Hall baiter Clay Chastain. It was a square shot to the Tall One’s teeth, and everyone got it: Because she dared to take on the mayor, Marcason is not on one, single committee. A few minutes later, the forum ended, and I went over to get a word with Marcason. “How strong is your desire to see the mayor turned out of office?” I said. I asked her if she had endorsed any of the other six candidates. No, she said, but added that, in her opinion, there were four strong candidates — Burke, Hermann, James and Rowland. We returned to the subject of Funkhouser having denied her a spot on any council committee.